Assassins is one of those musicals that I love despite never actually having seen it. So when Jill of Cherry and Spoon and Gina of The Room Where It Happens suggested a TCTB road trip to Duluth, where Renegade Theater Company is performing Assassins, we were SO in. 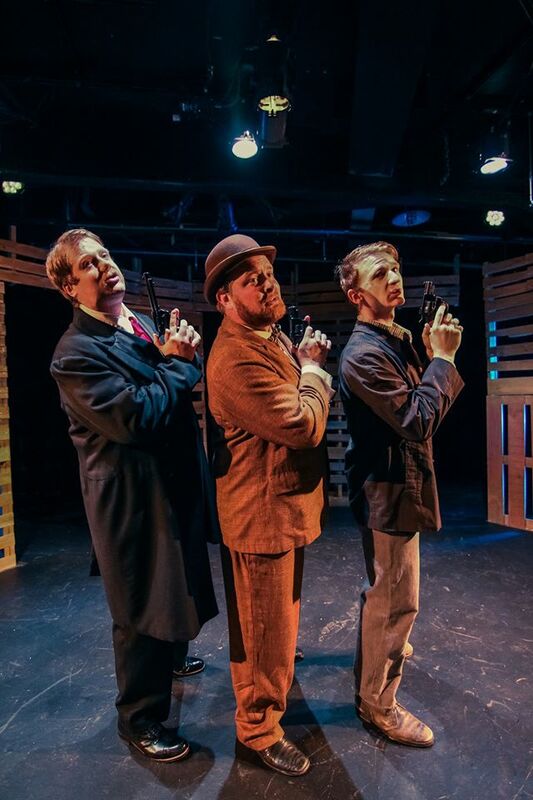 Our theater bloggers agree: Assassins is well worth the drive to Duluth. We all agreed that had it been playing the second day of our trip, we would have happily seen it again. Fun fact: It does not take long at all to: a) think that you are spelling assassins with way too many esses, and b) for the word to look like utter nonsense. Back to Duluth! Assassins is directed by Renegade Artistic Director Katy Helbecka, and playing through September 18 at Teatro Zuccone at the amazing Zeitgeist Center for Arts and Community. Don't know Assassins? It's a rarely produced Sondheim musical (more about that later), about the nine people who have attempted to kill presidents. Some succeed, some fail. 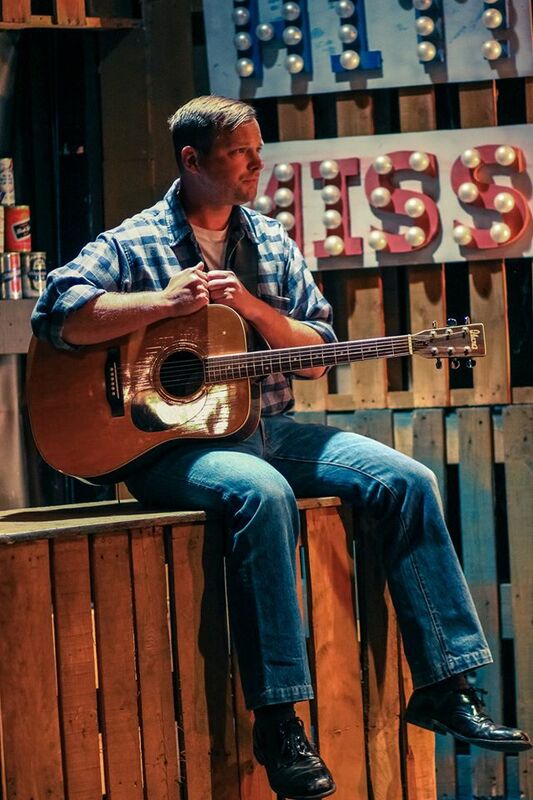 The show's setting is a shooting gallery, with a proprietor (Jack Starr) acting as master of ceremonies and a balladeer who tells the stories (Abe Curran). The assassins themselves wander in and out of scenes, meeting up with one another, finding their similarities and their differences, occasionally serenaded or sung about by members of the public. The performances in this production are outstanding, starting with John Wilkes Booth (Andy Bennett), about whom the Proprietor sings, "Hey friends, look who's here/It's our pioneer." Bennett perfectly encapsulates Booth's accent, demeanor and passion, and sings beautifully. I'd like to say that Bennett is the heart of this show if it didn't feel so wrong to say such a thing about someone portraying John Wilkes Booth. Another standout is Joe Cramer, as Leon Czolgosz, who is in love with Emma Goldman and shoots and kills William McKinley. It's hard to believe Cramer is a young, Minnesotan actor--he completely embodies 1900s Polish immigrant Czolgosz. Again, the accent is impeccable, his look is spot-on, and he portrays Czolgosz's anguish both in love and politics perfectly. And in keeping with the black humor of this show (because how can a musical about assassination attempts be anything but darkly comic? ), he adds occasional light and unexpected humor to his scenes. Charles Guiteau (Nathan Payne) is already an amazingly larger than life character, but Payne gives it all that and more. So animated, he beautifully straddles the line between over-the-top charm and utter lunacy. His scenes with Sara Jane Moore (Mary Fox), the 40ish former FBI informant who tried to assassinate Gerald Ford, are completely off-the-wall. Every move that Fox makes is riotously funny, whether applying lipstick, fending off Guiteau's advances, or showing really poor gun-handling skills. She is especially hilarious with Squeaky Fromme (Emily Bengston, playing a perfect straight man to Fox), her fellow Ford (attempted) assassin. 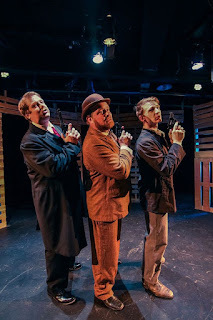 One more standout: from the ensemble, Kendra Carlson, who gives a nice depth to her parts, and has a marvelous scene (as Emma Goldman) with Czolgosz. The Teatro Zuccone at Zeitgeist Arts is perfect for this play. The shooting gallery set is simple but effective, with posters of the presidents as targets, and bright signs that read "Hit" or "Miss" as each assassin aims at their mark. The lighting is beautifully done, and the costumes are perfectly period-and character-appropriate. Although the intimate space makes the wonderful singing even more compelling, it is a bit unnerving. I'm seldom in a space where so many people are aiming guns right at me. I'm absolutely putting Renegade Theater Company on my must-list for theater. Having looked at all the fabulous photography of their past shows, I feel I've missed quite a lot of great shows. 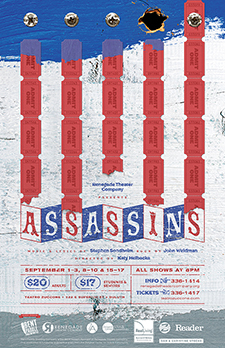 Despite having music and lyrics by Stephen Sondheim, and book by John Weidman, Assassins is performed rarely. Based on an idea by Charles Gilbert Jr., Assassins opened off-Broadway in 1991, where, according to Weidman (in the 2004 Broadway cast recording): "It received a uniformly chilly reception from the critics and, on most nights, an equally chilly reception from the 147 subscribers who crowded into the tiny theater at Playwrights Horizons where it was performed." The show received a second shot at life thanks to Sam Mendes and the Donmar Warehouse in London, where Sam suggested adding another song for ordinary Americans. Weidman explains, a song: "in which they would be given an opportunity to express the simple, uncomplicated grief which we all experience in response to these vicious, horrific acts." Enter "Something Just Broke," and a successful London run for Assassins. A very good question. I wonder the same. * A note for anyone interested in Assassins. I highly, highly recommend the 2004 Broadway Cast recording. Not only is it filled with amazing performances, but the liner notes are terrific, with the aforementioned essay on the theatrical life of Assassins and background information on the assassins themselves.